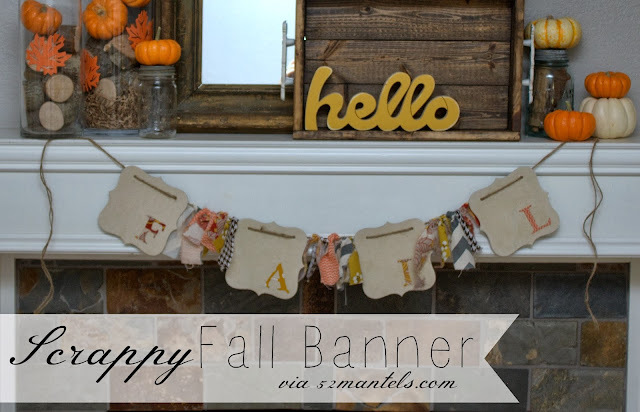 Today, I'm over at Design, Dining + Diapers, sharing my scrappy Fall banner with Taryn's readers. 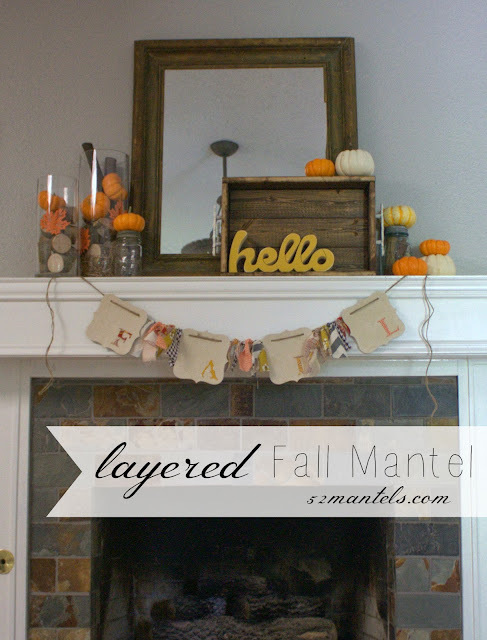 And, I thought, while I'm at it, I'd share my Fall Mantel with YOU! You may have noticed I've been a little lacking in the mantel department. After my 52 weekly mantel changes, I was pretty, how should I say? Over mantels. I'm not going to lie, I needed a mantel break. Originally, I'd planned on doing a Halloween mantel and then a Fall mantel...but, that Halloween mantel might not happen. 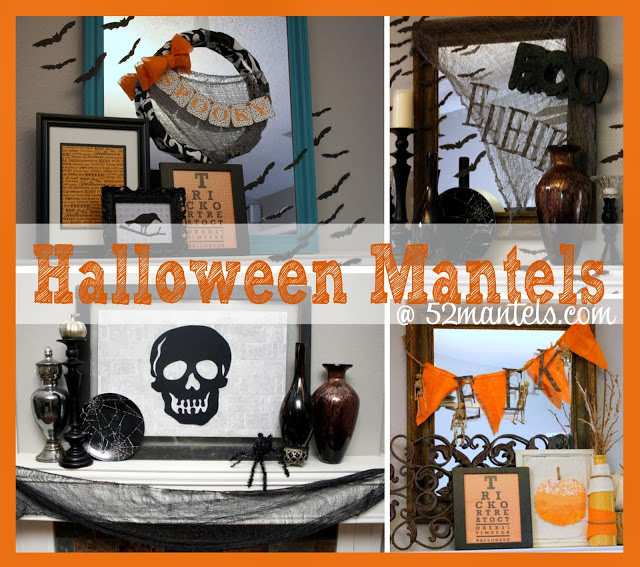 I think I'll just enjoy looking at all the Halloween mantels in blogland instead. You don't mind, right?? But, success! I DO have a Fall mantel. 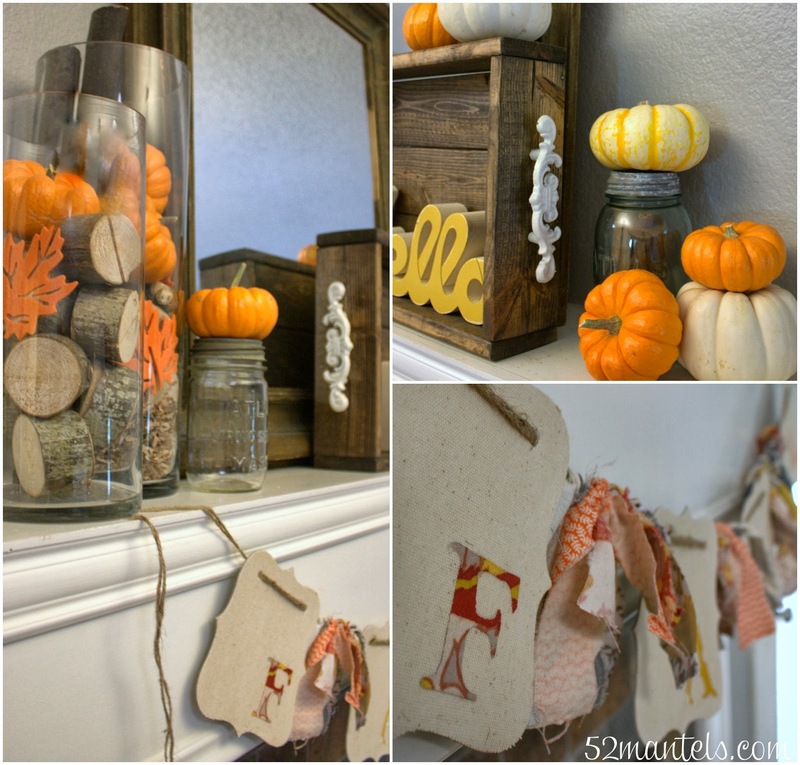 The deets: I used lots of my favorite small pumpkins, glass vases filled with wood pieces and a pretty wooden tray (made by a dear friend-- she should sell these, right??). And, of course, my scrappy Fall banner. Easy and earthy. If you want the (quick! easy!) tutorial for my Fall Banner, head on over to Design, Dining + Diapers for all the deets! And, if you really need some Halloween mantel ideas, you can check out some of my past Halloween mantels. I love this idea! Often times the mantelpiece gets ignored until Christmas, but this is a great way to get into the Halloween spirit. I always LOVE your mantels! The mini pumpkins are adorable! I always love everything you do, no matter how simple. I wanted to come over to your blog to leave you a comment. I have a few of those little chipboard books, not fabric covered. 2 of them are in shape of houses, a scalloped square and others are flowers so guess I'll use a house shaped one. Love shape of yours but guess I'll make do with what I have. I haven't seen those chipboard books anymore at our Michaels in Grand Junction, CO. Thank you so much for your sweet comment!! I haven't seen the house shaped chipboard, but it sounds cute! My Michael's still has a few chipboard albums, but maybe they're phasing them out. I'm with you on the Fall colors-- it's my favorite. I don't really love Halloween decor, if I'm honest. Anyway, thanks so much for your sweet comment! You always make me smile. For some reason, I didn't get email notice of these comments. But, I'm glad I opened this back up and saw your message! I am glad we get to see another of your mantel designs! You deserve a break from Manteling , it's if there is such a word! For a while- but you are so good at it!!! Enjoyed your new fall display! Take care! well, thank you, Ann! I feel like I need all new stuff for some fresh ideas. But, for some reason, hubby doesn't agree. Ha! Awesome, Julia!! I can't wait to see what you come up with!! Love it! All of the natural elements are so pretty together -- tons of texture here! And I love the "hello" sign. :-) Too cute. What a Summer 2016 Kyrie Irving is having. Kyrie became just the fourth player in basketball history lebron james shoes to win the NBA championship Nike Store the same year he won Cheap Nike Air Max a Gold Medal in the Jordan shoes Olympics. The other three are yeezy boost 350 moonrock Michael Jordan, Scottie Pippen, and nike free trainer 5.0 teammate LeBron James. With all yeezy shoes of that history in mind, fitflop outlet Nike Basketball is taking advantage kd 8 by releasing a number of yeezy boost 350 turtle dove new Kyrie 2 colorways like Nike Factory Store August 31st’s Kyrie 2 Summer Jordan Shoes 2016 Pack.